I just got back from an amazing weekend in Milwaukee at the 2018 Barbara Vey Weekend. It was amazing meeting all the readers, and reconnecting with my author friends. If you’ve never been, I can promise, if you love authors and books, you will enjoy it! ← Hot New Giveaway from Sam York! 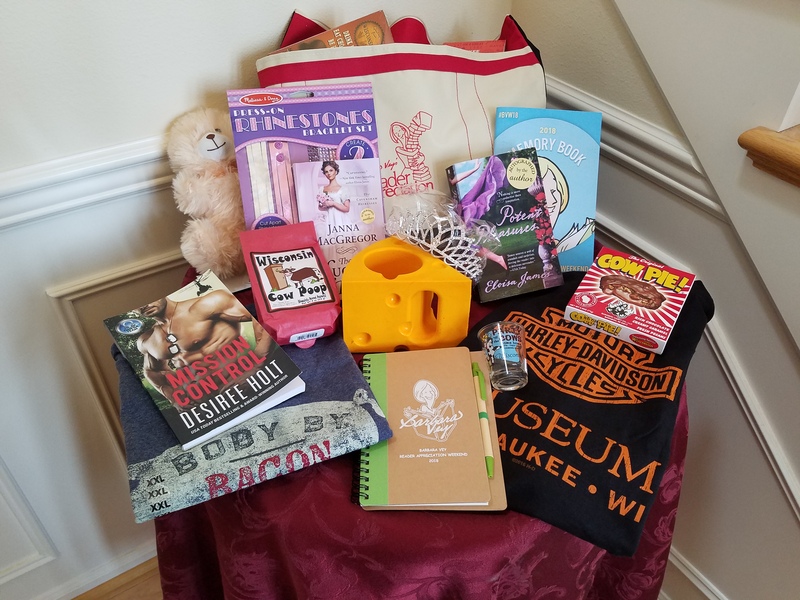 22 Responses to Win my #BVW18 Mega Swag Basket! Eeeeek. Thank you for the opportunity !!! Oh, it’s my pleasure, Kelly. I love giveaways too and being an author for me is like Christmas! Thank you for the chance! You’re awesome! Wow wow WOW! All of that and the Harley t-shirt too! Sweet giveaway! Thank you so much for the chance – this is really generous! Total awesomeness! Thank you so much for the chance sweetie. Thanks so very much for the chance. ! ! I thought I entered, but I don’t see my response? Love book giveaways. Marcia, you won’t get a response. But I checked and YOU ARE ENTERED! Thank you for the chance to win a great giveaway! Those are awesome prizes. To one of my all time favorite authors! Thanks so much for this chance!! Fantabulous Swagalishious Giveaway! So Thankful for the chance! Thank you for the opportunity to win. You are awesome!